A few hours ago, when we are all heartily devouring our breakfast with our loved one, Fadzil's heart stop beating for a moment...Thanks God, doctors managed to resuscitate his heart and now put him in 24 hours sleep and on round the clock observation. I still remember 15 years ago, when i was being 'interviewed' by my future father in law who is coming from Parit, Perak. He asked me that since i claimed that i played chess, i must surely know one Cikgu from Perak named Cikgu Nayan...and must know also Cikgu Nayan's son. I said yes, i have heard about Cikgu Nayan and i know his son personally (Fadzil Nayan). Fadzil Nayan is best known as Asian Amateur Champion, fine running in many local tournaments and also fine showing in recent Olympiad. Well, just too many to mentions. His best tournament? His best tournament will be the one in future. He will rise again like phoenix from ashes and like Mikhail Tal, who conquered his kidney problems to produce success in chess. Continue fighting, Fadzil Nayan...get well soon and continue to play chess again! No, I am not referring to a current flooded situation in Malaysia. I am referring to current chess tournaments that 'flooded' Terengganu's landscape. In a month's time Terengganu has quietly organized 3 chess tournaments! and this is just the beginning! Terengganu plan to organize up to 20 'mini' Blitz circuits this year. Last month, out of blue, Norazmi Mohd Noor had his eureka moment and suggested 'Why don't we organized many small blitz tournaments, sponsored by a player in which all entrance fees will go to this player? It was just brilliant! Tournament is created, players can take part in blitz chess tournament and sponsor can hope to profit via cash collected from entrance fee and by winning cash prizes. Lean and mean, no excess fees to pay organizer, arbiters etc. All are done by the players. Those interested to take part (and wish to play hot, hellish fast chess in heavenly tropical beach surrounding Dungun, you may contact Mr Abdul Rahim at 013-9390419 for more info. For record below are the winners of the previous 3 editions. So that is how the Blitz Tournaments are created in Terengganu. In an immortal words of Abraham Lincoln...Tournament of the players, by the players and for the players. With this posting, looks like i have posted about Terengganu chess for 3 times in a row. A hat-trick. But i cannot help it, not with these so much interesting and positive developments that currently happened in Terengganu chess. I called this phenomena as Second Revival of Terengganu Chess. Pak Sachlin Mail, our head honcho then, even let half of his house as sanctuary to us, chess refugee/ addict. Of no surprise we are able to produce national players such as Ghalam and Norazmi and dozens other players that able to keep breathing fire at their neck! Now it is about to change... The passion is back! Part of it is no doubt due to Ruzenan's effort in gathering most of Terengganu players from 3 generations (Sargon Generation, Mephisto/Novag Generation and Fritz/Chessbase Generation) under Whatsaps Group called 'GanuMaster'...with aptly 'GM' as abbreviation! From this group, many old warriors are manage to be seduced...and lured to play chess again. Most notably is the comeback of many players that have retired from the game for a long, long time. The players from 'Novag/ Mephisto' era such as Lim Sim Leong, Adnan Salleh, Azli, Lutfi Amir, Cikgu Hafez and Heng Aik Kiat etc. From these list, many i know are opening their dusty and yellowish chess books again and some even started to enter tournaments after tournaments like man possessed! Talked about Heng Aik Kiat or better known as Franco Heng, two weeks ago he is the undisputed winner of tournament he entered, an Inter Mosque Chess Tournament. Only in Terengganu, non-muslim entered chess tournament organized by a mosque (and win!). Chess here after all manage to do what politicians in this world tried to do (but failed), unite all regardless of race and religion. Talked about passion or love of chess, last night we, GanuMaster's citizen, are shocked to know about one of Terengganu player (Khairul Hafiz), met with an accident that resulted in his car spinning turtle many times over. Condition of his car is total wrecked (but thank God, he is ok) and an hour or two after this nerve wrecking accident, and due to perhaps without his car, he can be seen busy arranging for his transport to his next chess tournament at Tronoh. This morning, he went to the accident site to recover his chess set and clock! Tournaments are now also many. From planned tournaments to 'spontaneous' tournaments, from offline to online...its everywhere. Talked about tournament, Ruzenan is now busy preparing to hold a lucrative year end tournament called Ganumaster 2014 with thousands in total prize fund. ...and i just yesterday manage to get my leave approve to enter this tournament. 'Emjee' is a moniker or nick name to Terengganu chess player, Fairul Yusof. All above and more makes we (Terengganu chess players) all loved him! I first met him some 25 years ago at now the legendary Kedai Aziz. He is then working at RHB Bank. Though relatively latecomer to the game, he quickly grasp the idea of the game and in no time become one of the Terengganu's top player. This is of no surprise since he is blessed with brilliant mind and naturally he is very excellent academically (especially in advance mathematics) and was shortlisted to further his study in US before some nasty twist in kaleidoscope shattered it to pieces. Above is not the only life test he faced. I have witnessed many occasions in which world seems totally against him but slowly and surely he rises again like phoenix rise from ashes. For record he is now a (very) successful Terengganu's 'keropok keping' producer. Good chances if you are eating Terengganu's genuine 'keropok keping', it is probably produce by his company! One thing i could not forget is how before i started working, some 17 years ago, i realized i probably do not have enough cash to live at KL before i got my first salary. I asked him whether he could help me, quickly he lend me RM300 and a month later, i gladly, upon received my first salary, first things i do on lunch time is went to nearest RHB bank and deposited back RM300 to his RHB's account. But let's talk about him as chess player. Some times ago, when Ghalam still playing active chess, most of Terengganu players dream of becoming a GM (who don't? ) and foolishly started to put 'GM' in front of our name. For variety some put G-OM and Fairul chose 'MG', under reasons best known by him. After some times all these GM-pretend-names disappeared but 'MG', now spelling evolve to 'Emjee', stays! Chess Odyssey take this opportunity to wish Emjee a successful quest to become Terengganu's first titled player... and speedy recovery from high fever! A month ago i joined my primary school Whatsapp Group and off...i went back to 1984 when i am still schooling in Kajang. Thanks to Arshad and Ruzenan (Administrator), I joined a Terengganu chess players Whatsapp group called 1Catur Trg last week and I swear, immediately, I am off to a place 300 miles away and i could feel that i am at that Kedai Aziz again. Here, at 1catur Trg, sweet bantering are common...exchanging of jokes are norm...the friendly teasing...the live telecast of chess matches...pictures of players. Man, I love this group! Here we talked chess and only chess, and we do this in our unique and private Terengganu Chess languages that have been evolved and developed over the last 30 years. Example are 'kena pepoh' (severely beaten) or 'sippang kuda' (keep the knight) or 'nok mussing' (want to castle) and so on. What I like here is, unlike my other half dozen Whatssap Group, here we talked pure chess...no advice to be a better person....no request for donation...no silly jokes/ videos...no mentioning about expensive gift received from hubby,...no picture of dining at that exclusive restaurant...no. Just a bit of chess, a sprinkle of caissa, a dose of catur and lots and lots of friendship. Here, we are known via our moniker. We have here Mexico, Papa Midnite (me! ), German, Franco, Pracih, England and ofcourse, the group favourite player, emjee!...and few more. Just too many to mentioned. Whoever that created Whatssap. Thank you very much! Move over to 21st century the K vs K battle spilled out of the chess board...we have Kirsan vs Karpov and now it is Kirsan vs Kasparov. Now the stake is higher, instead of to determine who is the champion of 64 squares, now it is to determine who is the champion of 196 countries. In all of these battles (with exception of Kasparov vs Kramnik), challengers always lost on their first encounters, challengers are also always facing an uphill, unfair task of fighting the champion. Who could forget what Korchnoi faced when playing against Karpov in 1978 (his family is still in Soviet Union then), or what Kasparov faced when playing against Karpov in 1984 (FIDE stop the match when Karpov starts losing game after game). Hmm, strange to think that chess as an intellectual games comes up with all these non intellectual, nonsense rules... and chess as a game that supported fairness (both black and white pieces carry the same height, weight and speed, each player can moved equal number of moves etc), suddenly in the biggest chess battle, unfairness can be seems everywhere. So true is what Orwell said in Animal Farm. "All animals are equals but some animals are more equal than others"
Kirsan got the advantage no doubt about it. 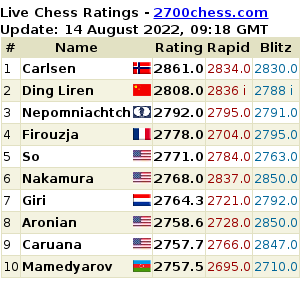 If these are an hypothecal chess match, i put Kasparov's rating at 2850 and Kirsan at 2820 BUT...Kirsan is a defending champion and Kasparov needs to win that extra game (assume this is old rule) to clinch victory, and Kirsan is well supported by the best seconds and best super computers, and it is played at Kirsan's country.